A thriller but with a difference!! 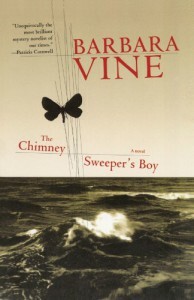 THE CHIMNEY SWEEPER’S BOY by Barbara Vine is a standalone novel from the renowned British crime novelist, who is best known for her psychological thrillers. Gerald Candless, a bestselling and a onetime Booker prize shortlisted author dies suddenly, the day after entertaining guests at his house on the British coast. As his publisher approaches one of his daughters, Sarah (the other daughter being Hope) to write a memoir in her father’s memory, she accepts. But, while moving forward with the project, she encounters the first and a decisive hurdle as she realises that her father was not Gerald Candless at all, he just used that name, as she digs deeper she comes to realise that although she played the perfect daughter to her daddy, but she never really came to know the real person behind the man they called father. As the author information of my edition pointed out, that Ruth Rendell is Barbara Vine. Now, a Ruth Rendell novel never focuses solely on the crime, they also digs deeper into abyss of human minds. Though this eternal search of the human abyss does not always provide the novel with the extra punch, but she does manage to keep the focus of the book on the crime, and not turn the book into psychology thesis paper. Barbara Vine maintained the trend, and as a result we got a novel where the mainstay of the plot becomes the mingling of lives and psychology of a famous author who lives under an assumed name, his wife who has a platonic and distant relation with him, his daughters who worships him as he makes them move away from their mother emotionally, and the authors relation with his books. Left to these, this book could have well turned into a drama, but Vine using her skill as a crime novelist ties all these aspects with an unsolved crime which gives this book the much required pace, and the atmosphere of a good crime novel. But, once again hats off to Vine. How does she create such wonderful characters? Sometimes I feel that if an author starts devoting countless pages towards character development then in most probability the book loses the plot, literally. But what if the characters and their development becomes the part of the plot? As it happened here, had the characters been not developed this book would also have fallen flat. To understand and hate Gerald Candless, his deep characterisation was needed. Same goes for his wife, Ursula, who comes out as a sad and much victimised character. But the greatest triumph was the daughters, Vine wanted them to be hated with gusto, I guess, so she made them snooty, mother hating, Daddy’s spoiled brats. And she was extremely successful. When it came to Sarah and Hope Candless there were few other characters that I have hated as much. Lastly, I don’t know, but while reading the book, I had a distinct feeling that maybe Rendell takes a dig at the so called “Serious” writers in this book. She gets it done by showing how upset Gerald Candless gets when his book is deemed a thriller and gets reviewed by the crime fiction reviewer of a newspaper. So, if anyone picks up this book, i would advise him/ her to get into it with an open mind. This is not a crime thriller in the strictest of sense, but if one can keep the patience, this is an enjoyable read.